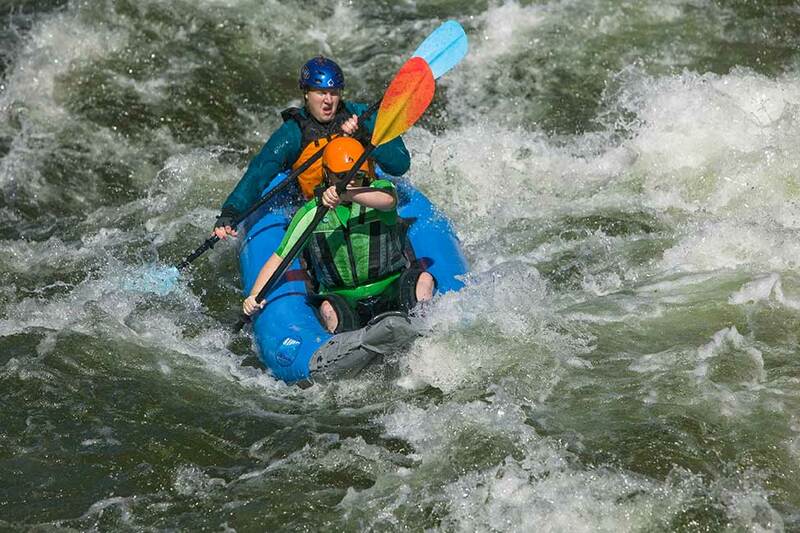 Whitewater AIRE Kayaks, Touring AIRE Kayaks, river rafts, whitewater catarafts, rowing frames,oars, paddles, and rafting accessories from AIRE, Tributary, Maxxon, , NRS, Hyside, Incept, Sawyer, Whitewater Designs, Caviness, and Boat People specialty items are found in this part of our website. Pumps, lifejackets, dryboxes, and safety gear each have their own sections. Our AIRE Kayak include self bailers as well as a few non-bailing "bucket" boats from NRS and Tributary. Tributary is AIRE's import line. Got questions? We have rowed, paddled, and sold just about every brand out there, so don't hesitate to call or come by. We love to "talk boats and AIRE Kayak," and would be happy to answer your questions. You can also email us at theboatpeople@hotmail.com, but just keep in mind that time can be tight for typing lengthy replies, so if you have more than a couple questions please phone us. Many potential boat buyers tend to get a bit confused and stressed trying to decipher and decide between various boat brands. The good news for all of you is that almost any name brand river inflatable whitewater raft will last a very long time, so it's hard to go wrong in choosing. Not all brands & models handle the same though, and the relative cost per year to own different makes may vary a bit. 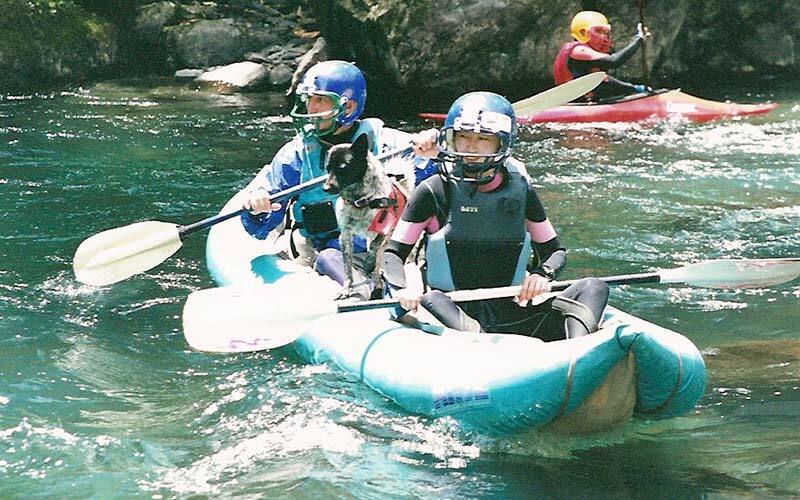 We try to offer the highest values, which is why many of the inflatable AIRE Kayak in this part of our website are from AIRE or AIRE's import Tributary line. We were the first AIRE dealer in California and we knew AIRE's owners long before the company existed. Greg Ramp, AIRE's prez & chief boat designer, used to make inflatable kayaks out of his detached garage in Grants Pass, Oregon way back in the eighties. From there he moved to Idaho to work for Maravia Corp, continuing to develop his ideas and setting up the huge "urethane encapsulation" spray booth they use to this day. A couple years later he co-formed AIRE with Kris Walker, and Alan Hamilton who we knew from his days as NRS's manager. Kris has since left AIRE to market his high performance marine cat designs. For us and for our customers, it's important that the crew at AIRE are easy to work with, and impeccably honest in covering their products just as they say they will. They are the only inflatable builder out there offering a warranty with coverage for damage you do to your boat, not just defects that are the fault of the manufacturer. Most of the other boat builders claiming ten or twelve year guarantees may only cover the hull material for that period, or have exclusions that make the warranty far less impressive than at first glance. Why cover your damage too? If you've managed to incur a large tear or other major damage, AIRE would rather fix the boat properly with their welders & sewing equipment as opposed to having one of their products looking rough due to a home repair, where the boat owner may not be equipped or experienced enough for the job at hand. AIRE's AIRE Kayak tend to be in line with, or priced lower than, the majority of other makes, and their line of imported Tributary's offer what is likely the best value around. Both are great performing rafts with no glue used in their construction, and this makes the Trib's different from almost all other Chinese and Korean pvc rafts. Now days, almost every brand of boat - even some of the cheap glued Asian brands - are plenty tough enough to the degree that few modern boats owners ever really need their patch kit. So when you purchase a raft you are really paying for two key things: lifespan - or what it will cost per year to own, and handling. 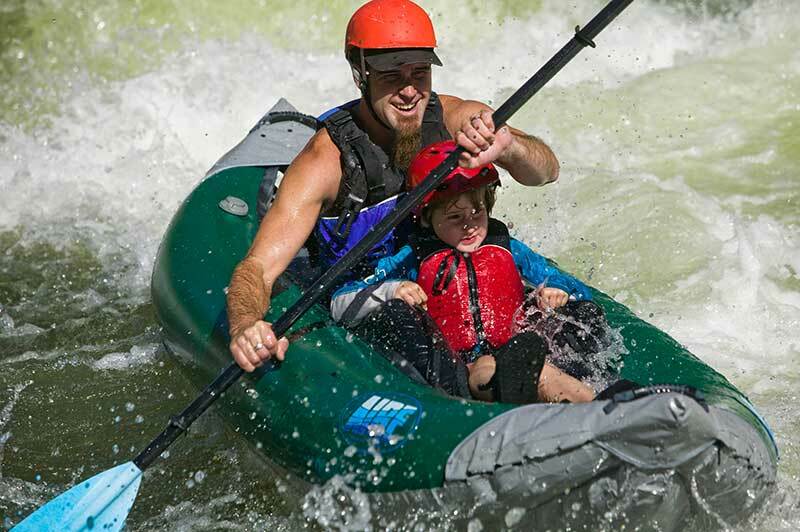 A "good handling" whitewater raft or whitewater inflatable kayak will be responsive through a wide variety of river conditions. This is not true of a great many hypalon brands and models, which most often tend to be more mediocre in their handling traits. But what about lifespan? Aren't pvc inflatable pre-disposed to less usable years than a quality hypalon model? If the boat is pvc and assembled with glue, yes, that is most often true. Even if it is just a straight-up welded pvc boat with no bladders, it may still fall short of a hypalon inflatable's serviceable years. 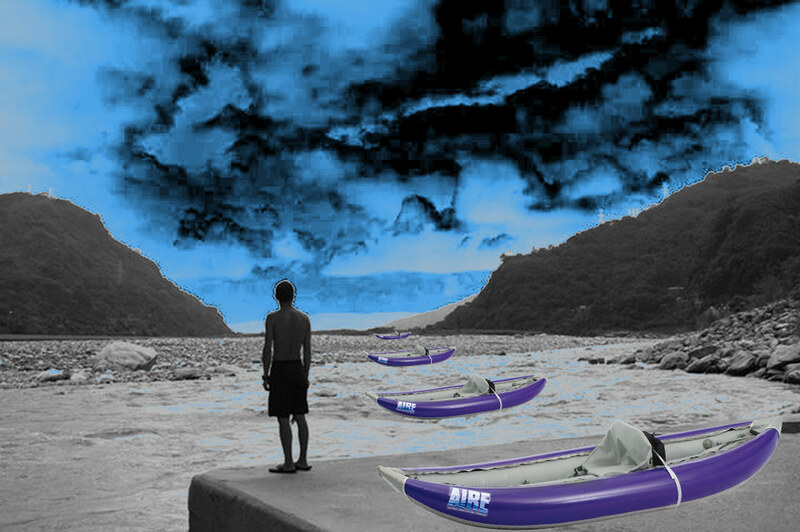 But by using quality urethane bladders inside their rafts, AIRE creates a craft with almost unlimited life. The outer hull of an AIRE could in fact be nearly worn down to the base fabric all over and the raft will still retain air just fine. There is no reason an AIRE boat can't go 30, even 40 years with upkeep, which is matched by only a very few other brands all of which cost quite a bit more. For the same reason that an AIRE can be made to last forever, it is also the most easily serviced in the field if something should go wrong. With all these considerations we don't feel there is a better rafting lifejacket than an MTI AIRE Kayak or NRS AIRE Kayak at any price. Although they are relatively new, the polyurethane NRS Revolution AIRE Kayak also seem to offer a very high value for the money, and better handling at a lower cost than NRS's hypalon (Orca) line. AIRE has an optional upgrade on all American made rafts to a Sealed Floor Pocket; more about that in the boat descriptions. Another new option that was added is urethane fabric for any AIRE raft or Cataraft. Pricing is given for this under the individual raft & cat sizes. R and D series AIRE AIRE Kayak have gray rowing frame chafer panels, though some of our photos still show the older models. For more information about multiple boat discounts, and discounts on accessories that are purchased with your AIRE Kayak, please see the F.A.Q. page of our website. In brief, all accessories except rowing frames and aluminum dryboxes receive a 10% discount. These two exceptions are due to low margins and high incoming shipping costs on dryboxes & frames.